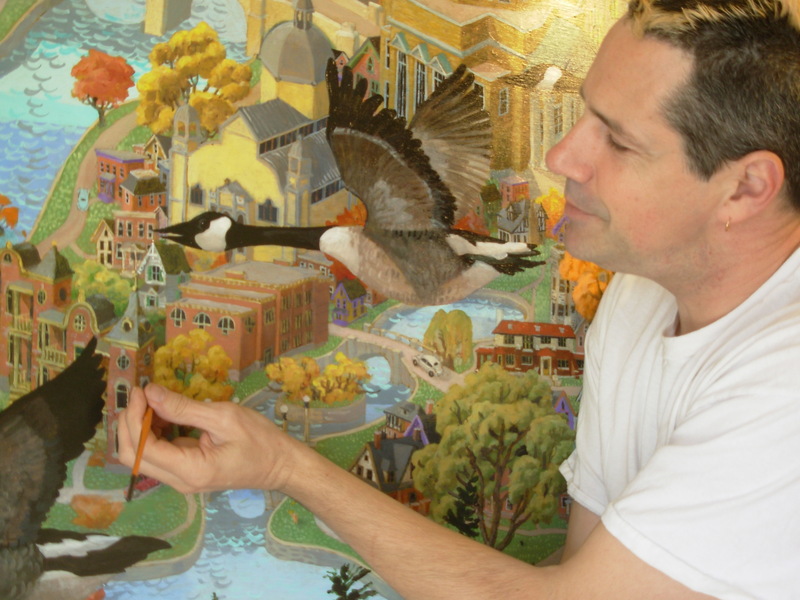 Bhat Boy is an Ottawa-based artist whose fantastical cityscapes and other works can currently be seen at two Ottawa galleries as well as on a briskly selling jigsaw puzzle recently released by the German company Ravensburger. 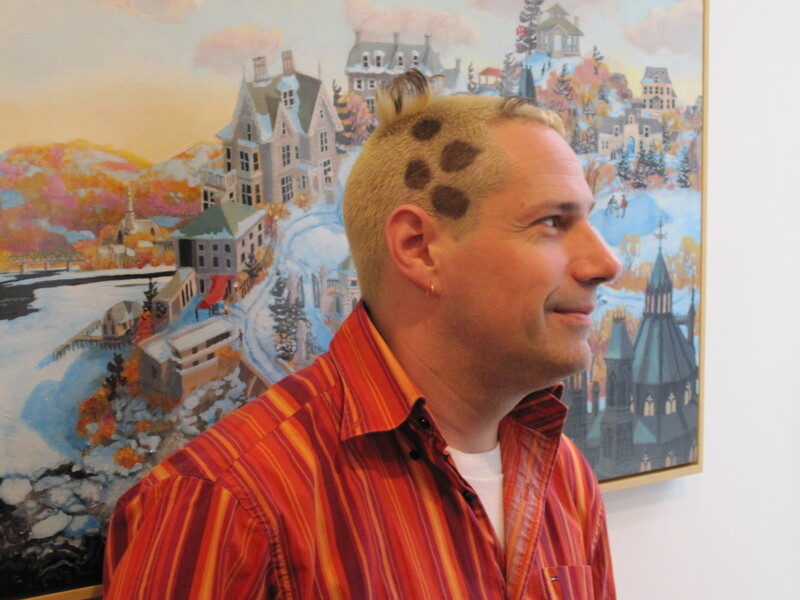 Anita Malhotra interviewed Bhat Boy at his home in the Glebe – a neighbourhood he paints often – as he prepared for a hectic day of gallery appearances. AM: On your website you mention that you are the son of a cleaning lady and a spy. BB: Well, it’s true. But my mom worked at Nortel at first. Everyone in the family worked at Nortel at one point – Nortel actually sponsored our family to come to Canada from England. But she got laid off later on and she went into being a cleaning lady because she found that it was much less stressful. As for my dad being a spy, it wasn’t until after the Iron Curtain came down and my father retired that I began to realize what my father did. It’s funny, I never knew what my Dad did when I grew up. He just worked for the government. 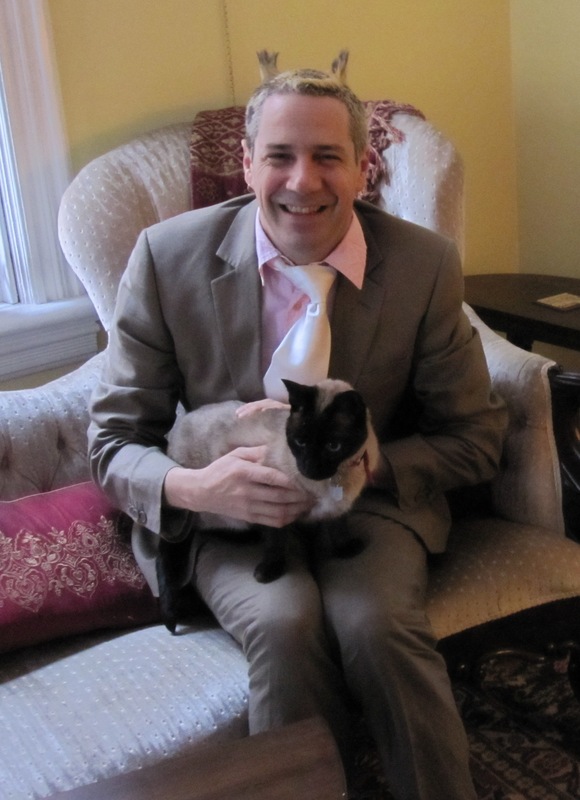 It wasn’t until much later that I realized that he was a “Q” type, if you put it in a James Bond scenario, because he worked in the development of spy technology. AM: What were your earliest experiences with art? BB: I had a Grade 2 teacher named Mrs. Kostach and she had a great influence. I remember we went to see the Nutcracker and we were all supposed to do a drawing. And I did my drawing of the Nutcracker and she sent it back and told me that I could do better. I was like, “Well, I never!” because my drawing was probably the best one in the class, but still she sent it back because she recognized that I had this ability. And then, when I was about 13, we had a lodger on the third floor of our house, a Swiss woman who was studying art history, and she was very interested in my art. She used to pay me to make Christmas cards, which was probably my first commission. AM: When did you start to become serious about art? BB: I was selling things quite regularly by the time I was 15, 16, 17. I would do house portraits and things. It didn’t seem a very practical way to make a living, though, so I took a bit of time off. Then I realized that it was what I really wanted to do, so I went to art college. Other than a period for a year and a half when I was a little bit grey about what I was doing in my life, the rest of my life has always been focused on some sort of artistic activity. AM: I’ve heard you say that you wanted to become an artist because you wanted to have an interesting life. BB: I remember being in Grade 4 or 5 in school, and some guy cut across the schoolyard in the middle of the day, and thinking, “I want to be that guy.” Because I used to hate being trapped in school. I’ve spent very little of my life actually in a job. The idea of being trapped in a job and having a schedule is really unattractive to me. I wanted my life to sort of be open and free, and certainly not have to get up and go to work first thing in the morning. I love being awake at night and I often paint until after 11 o’clock. That’s when I like to be at work. AM: During your studies at the Ontario College of Art and Design, you spent a year in Florence. Did that influence your work? BB: It did in a way. I chose when I was in college to study Fine Arts because I was interested in traditional art and traditional techniques, as opposed to much modern art, which can be a lot of idea and not quite so much technical substance. It was clear even when I was a child that’s what I was really good at, the technical substance. I was given that skill, so why am I going to throw away my God-given skills? And Florence is a good place to study art because it’s the birthplace of modern Western art. AM: How would you describe the style of your paintings? BB: I call myself an Envisionist. I like to think that I imagine things the way they could be, and I change and move things. I often say my paintings are more like you would remember or imagine a place, or even dream about a place. But if you tried to hold a photograph of the place up and look at it, there would be no logic. 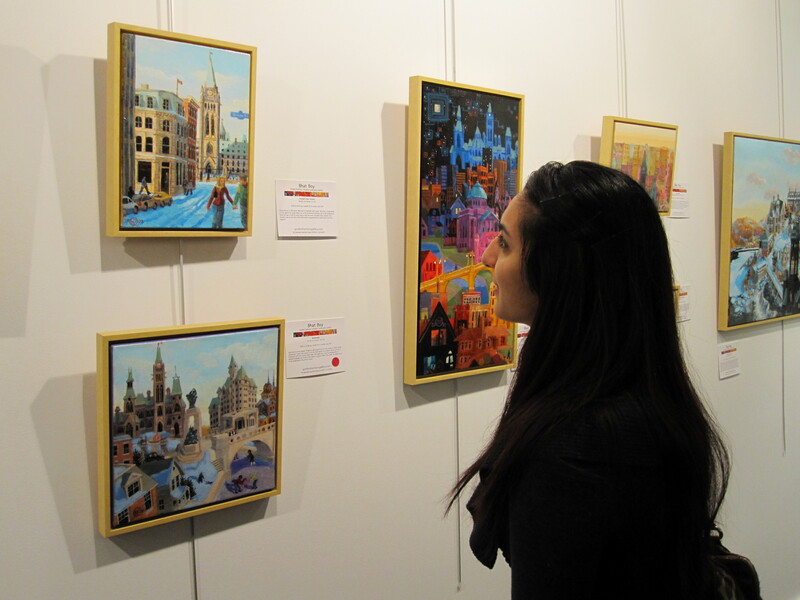 AM: Many of your paintings are cityscapes. 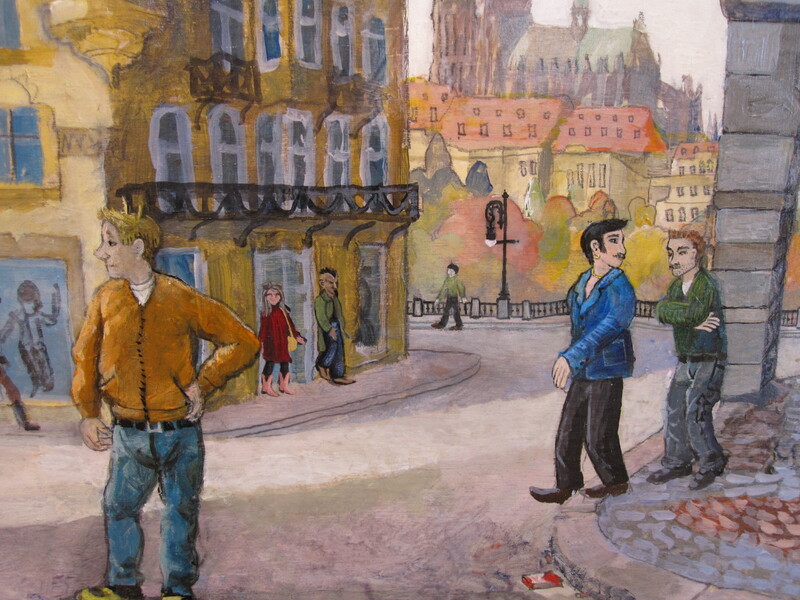 What is your view of the city and how do you represent the city in your paintings? BB: I like to reinvent cities into more human landscapes, or more human spaces. I tend to make them sort of medieval. Even when I paint modern buildings I make them almost look like medieval churches, and sometimes I even put walls around the city. But I change the scale and I’ll change cities to look like villages and towns. I don’t put figures in proportion to the buildings. I am less worried about the proportion, and more about whether everything’s going to fit into the painting. Often my paintings are quite tight because there is so much stuff in them. 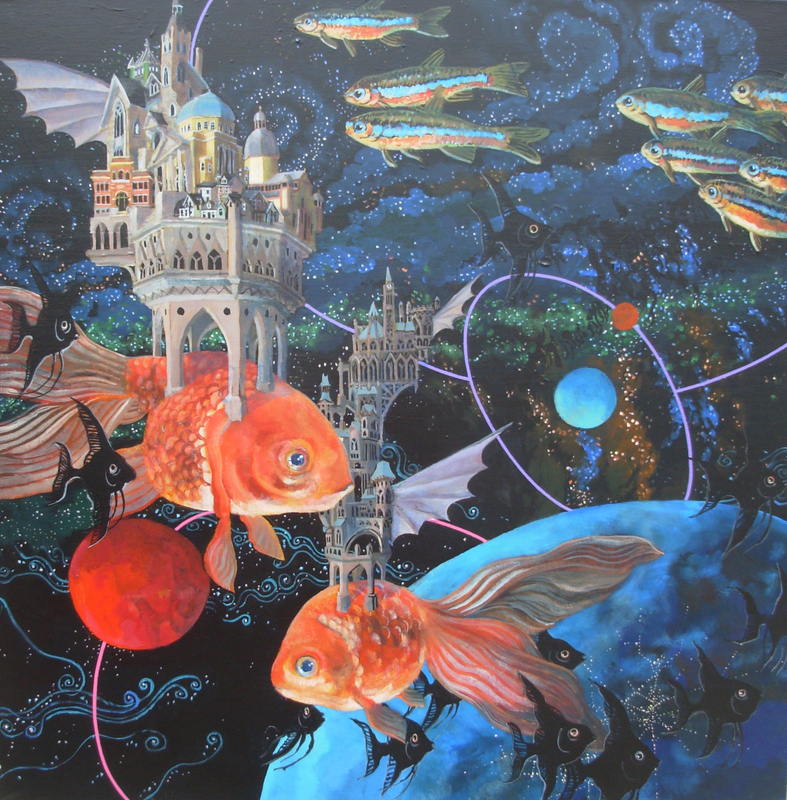 AM: What is the significance of some of the reappearing motifs in your painting, for example the nuns and the goldfish? BB: Nuns, dragons and goldfish are the three things I’m most known for. 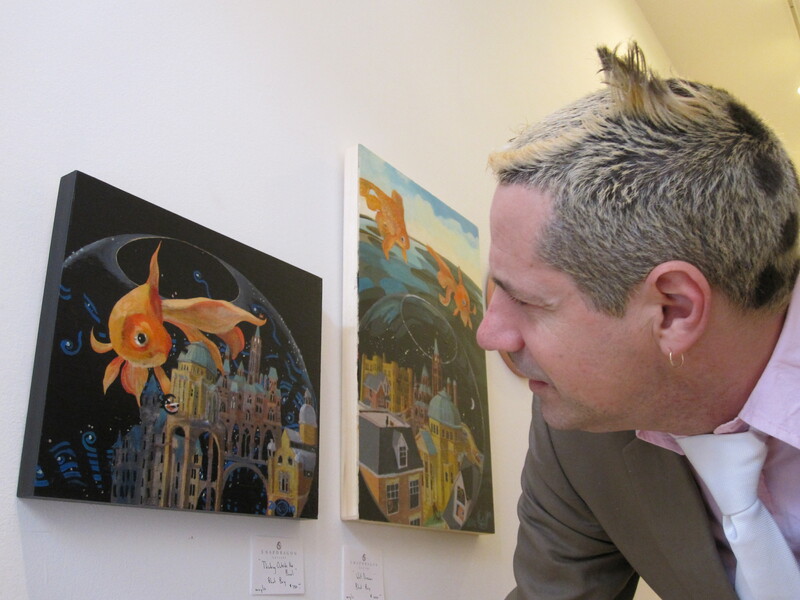 Goldfish represent the environment and the forces of nature. Nuns represent the traditions in society and how our society carries on from one generation to another, while dragons represent the mavericks and the boyish mischief, and the adventurers that didn’t follow all the patterns. AM: Much of your work is commissioned. How do you go about getting these commissions? BB: Commissions are about half of my work. Some of them are for businesses and some are for private homes. 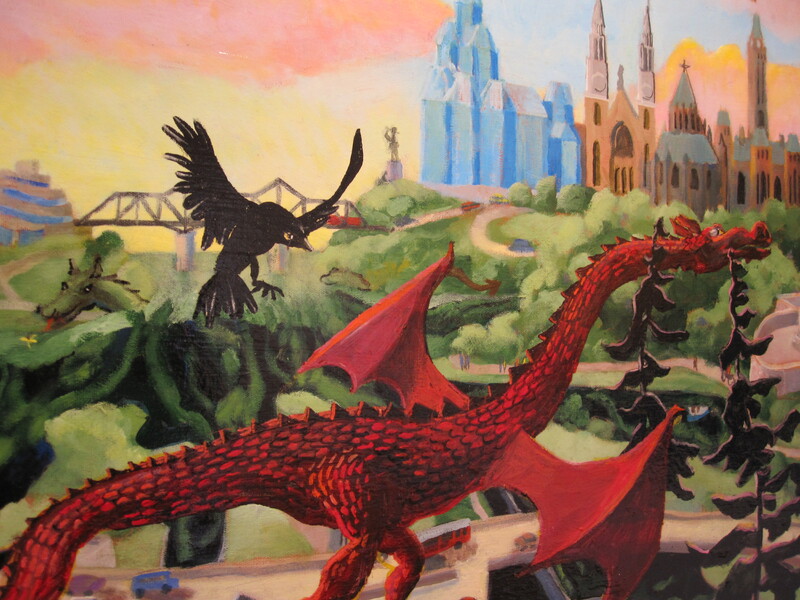 I’m particularly known for doing paintings of the architectural icons of Ottawa, and people know that I do houses. So people look at my paintings and they’re always looking for their own house. And sometimes after a while they decide they’re just going to commission one and they can have their house and their mom’s house and their friend’s house and the school they went to and their favourite church and their cupcake store and whatever else they want. AM: How did the name Bhat Boy come about and why did you choose it? And I’d forgotten to tick off a box on my form, so they sent me back the form, and I decided at the last moment to add an “h” to my name. I really like the “h” because the “h” is for individuality and credibility. AM: Your work is in the collections of David Letterman and the late Stanley Kubrick, among others. How did that come about? BB: David Letterman actually has one of my hats. Before I got my signature hairstyle, I used to make my own hats and I used to put little ears on them. I met David Letterman in San Francisco and he bought my hat on the street. It was on the David Letterman show because he actually had his crew with him. That was about the same time I became Bhat Boy. I’ve never actually met Stanley Kubrick, but I have met his widow Christiane, and she bought a small painting from me. She’s a painter and has her own print studio and art classes. I spend quite a lot of time in Britain and she’s part of this circle of artists that I’m in and out of when I go to England. AM: You’ve said that your work is market driven. BB: It’s not that I actually make commercial art but when I see something that sells, obviously it’s going to encourage me to make more. People love to be idealistic and think that there’s a complete segregation between money and creativity, but it’s not true because money is a great encourager. Our whole society is more or less based on valuing things through money, so obviously if I’m doing something and it’s being valued through money, then it’s going to encourage me to do more of it. And that’s not such a bad thing, because if I were trying to produce art that wasn’t selling, then I probably wouldn’t be making my living at it and I wouldn’t be painting. That’s just the way it is. 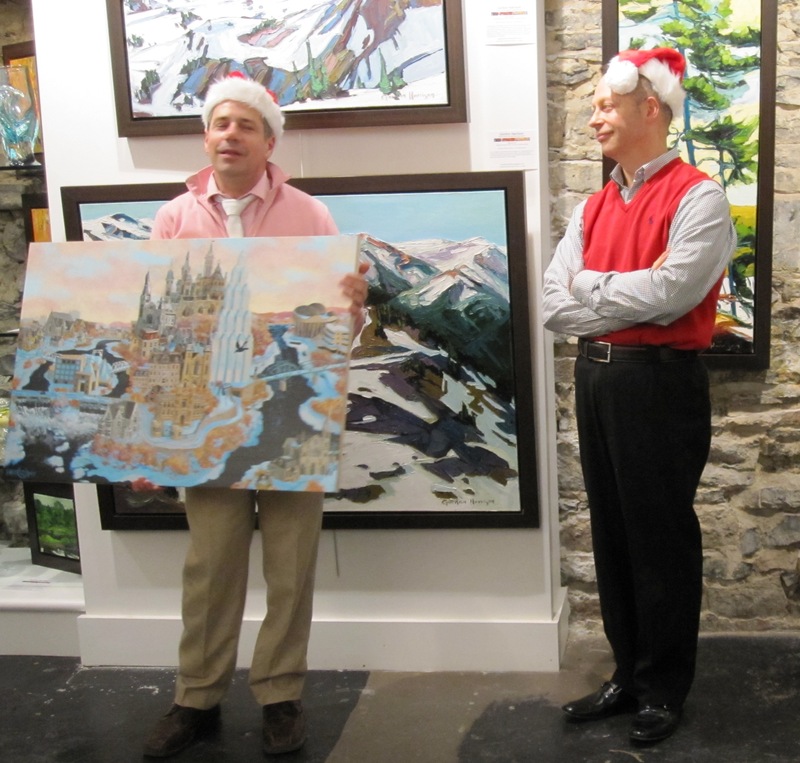 AM: Many of your paintings are of Ottawa. Why is that? BB: Of course I live in Ottawa but a lot of my market is in Ottawa. I paint other places as well, but it’s always a harder sell for me if I do a painting of London or Prague or San Francisco. 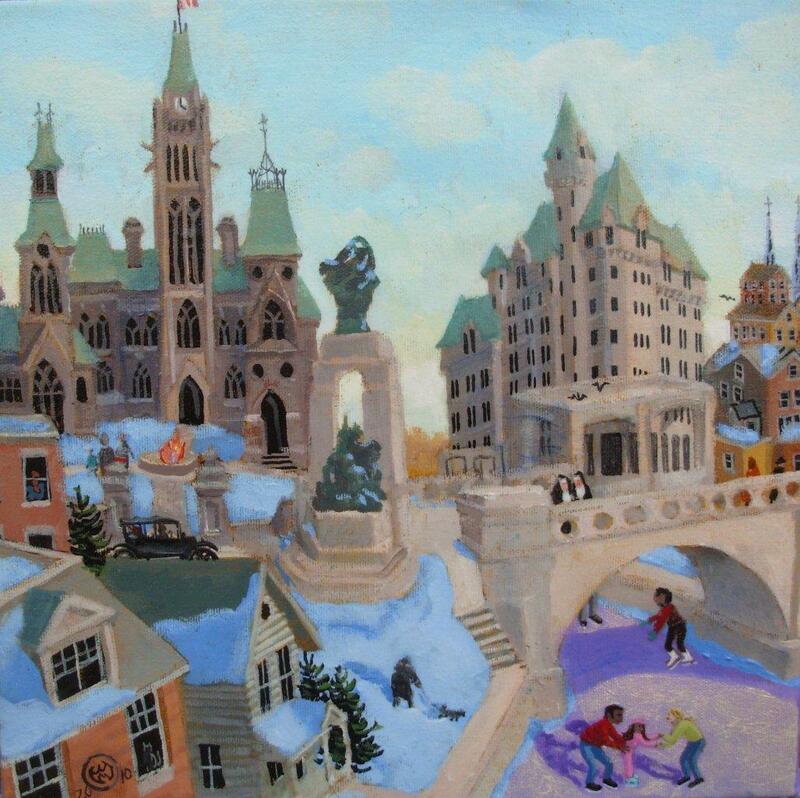 Not that I can’t sell them, but so much of my work is shown in Ottawa and people come here looking for Ottawa paintings. 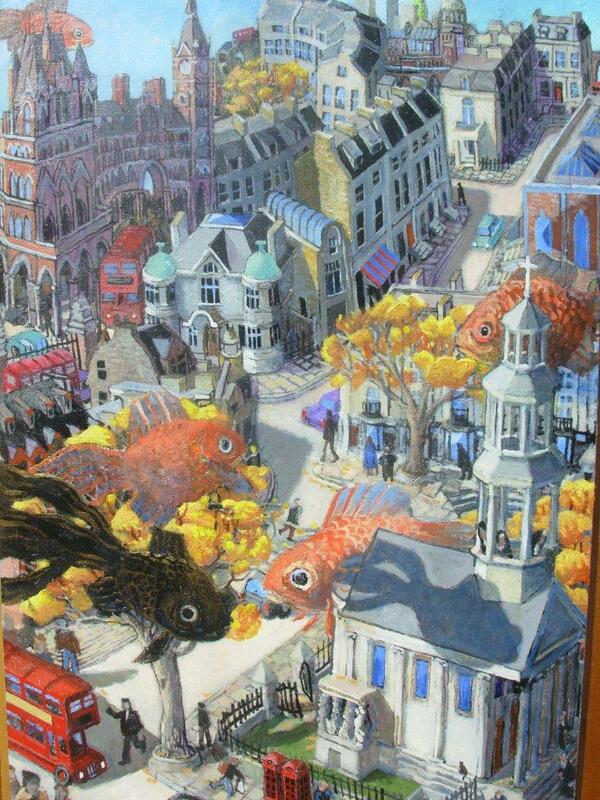 But if I lived in London, then I’d paint London all the time. 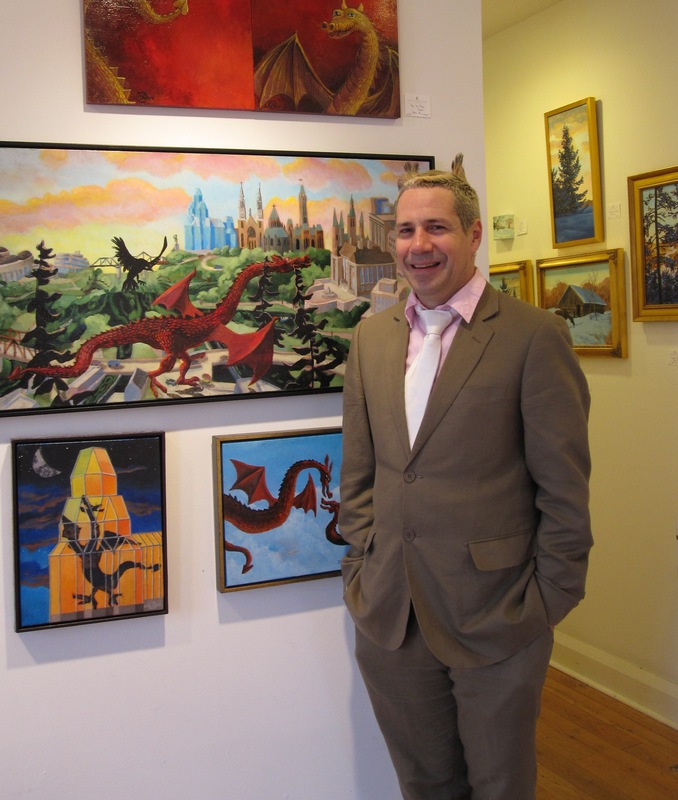 AM: Other than Ottawa, where else can your work be found? BB: I have work on every continent but Antarctica. Most of my work that’s out in public is in Ottawa but most of my work in the rest of the world is in private commissions. I think it’s really sad because sometimes I do beautiful paintings and they just get whisked away into people’s homes. I feel like nobody sees them. AM: Tell me about your current exhibits in Ottawa. BB: At the Gordon Harrison Gallery, I have a series of cityscapes, several of which are cubist, so it’s a bit of a departure for me. It’s part of me keeping my life interesting and not wanting to always be the same. 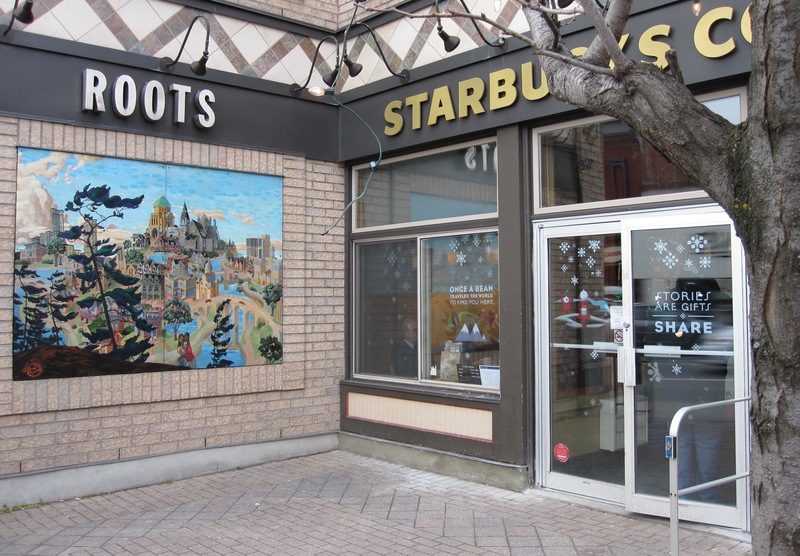 And my exhibition at Snapdragon is called O Canada, and it’s about all things Canadian. 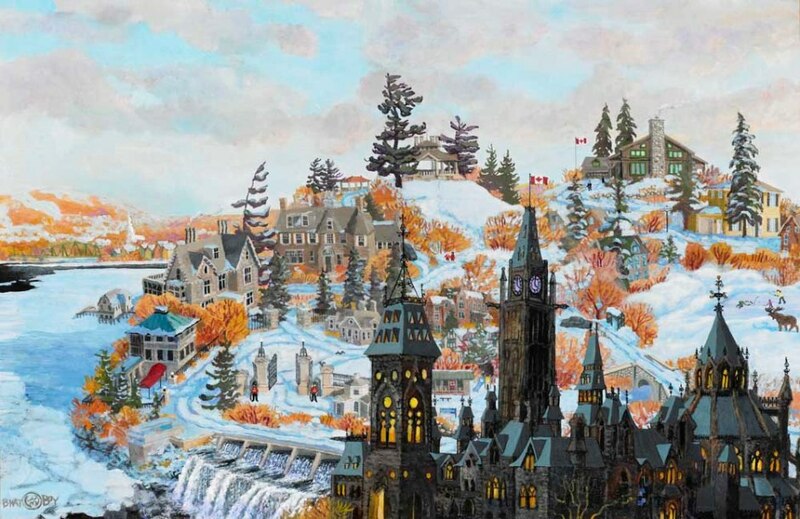 Some of them are just paintings of Ottawa but there are also landscapes and paintings of other things Canadian – there’s even a painting of the Queen with Mounties. It was really an easy thing for me to call it O Canada because just about everything I do is somehow Canadian. Bhat Boy’s paintings are on display at the Snapdragon Gallery until January 15, 2011 (although selected works will remain afterwards for a time) and the Gordon Harrison Gallery until March 31, 2011. 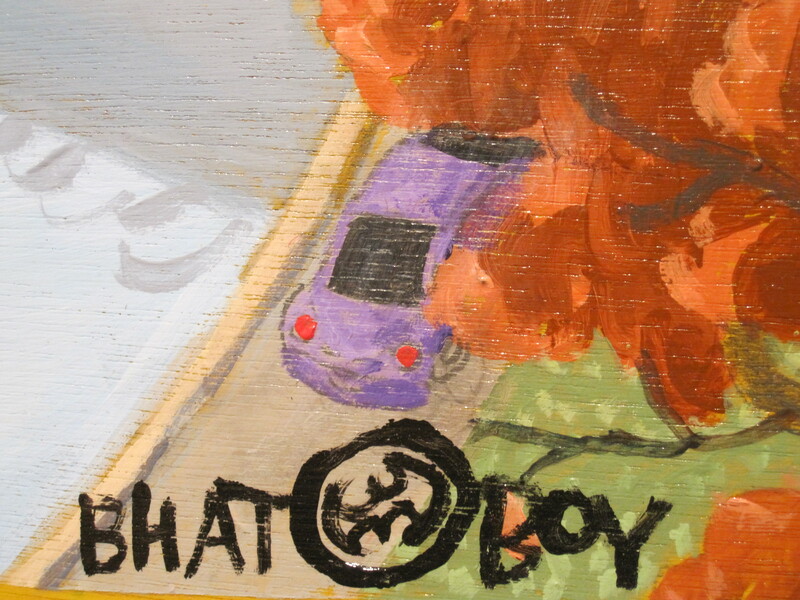 For more information about Bhat Boy, visit his website at www.bhatboy.com. 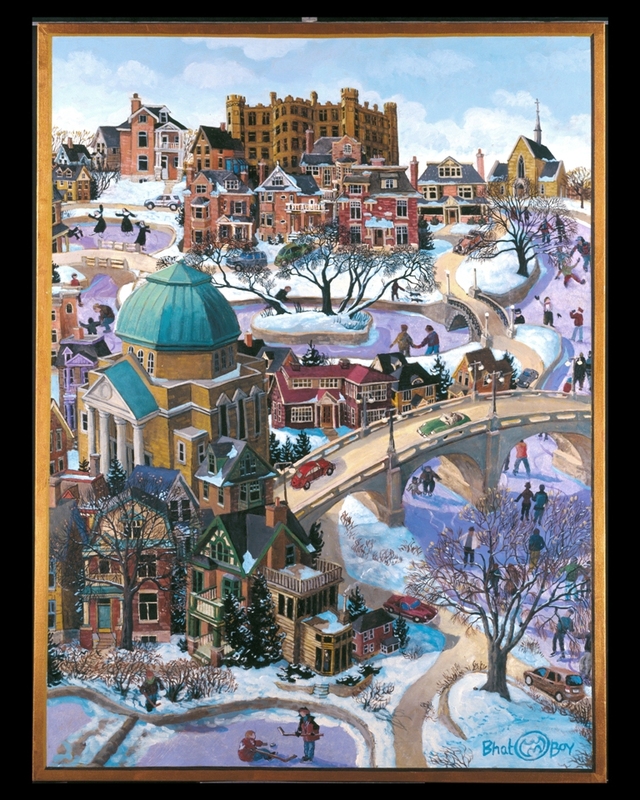 This entry was posted in ART and tagged architectural painting, Bat Boy, Bat Boy interview, Bat boy jigsaw, Bhat Boy, Bhat Boy interview, Bhat boy jigsaw, Canadian artist, Christiane Kubrick, commissioned art, Gordon Harrison Gallery, Ottawa artist, Ottawa painter, Ottawa painting, Ravensburger, Snapdragon Gallery, The Glebe, Winter on the Rideau Canal, winter scenes, Winterlude. Bookmark the permalink.